The EC 145 was a joint development between Eurocopter and Kawasaki Heavy Industries with the aim of significantly increasing the cabin space and take-off weight of the BK 117 C-1. Originally called the BK 117 C-2, the helicopter was selected by the French Defense & Civil Guard for air rescue missions in December 1997 and 32 were ordered at a cost of one billion French Francs. The first BK 117 C-2 completed its first flight at Donauwörth on 12 June 1999 and a second aircraft was built at Kawasaki's plant in Gifu. Eurocopter designated the new model as the EC 145 with the third prototype in April 2000 and safety certification was awarded by the German Luftfahrt-Bundesamt and Japanese Civil Aviation Bureau in December 2000. The EC 145 was shown at the Paris Air Show in 2001 and more civilian orders followed. 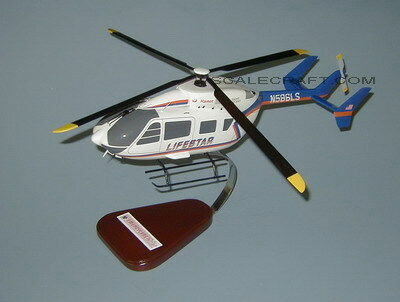 Safety certification was awarded by the United States FAA in February 2002 and the helicopter was shown at the Heli-Expo event in Orlando, Florida in the same year. Mahogany wood. Length 17 inches.